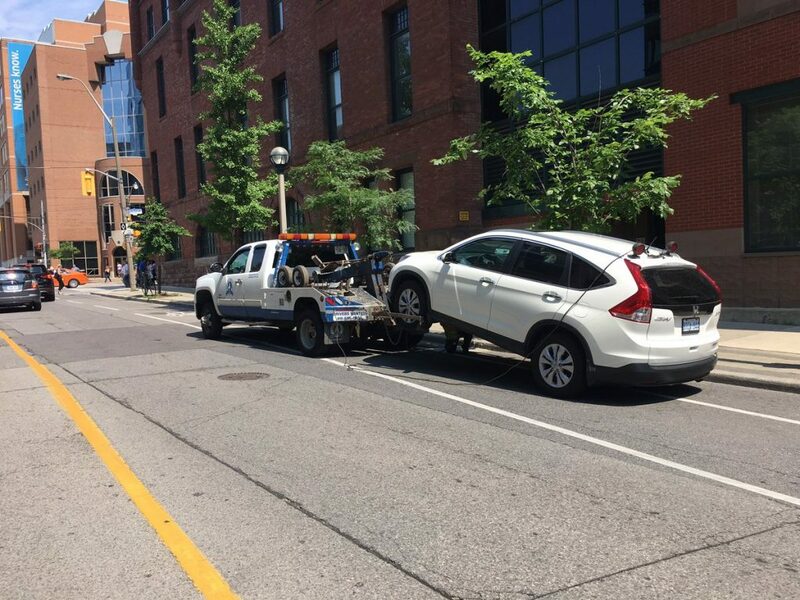 A common complaint among Toronto’s cycling community is vehicles illegally parked in bike lanes and the lack of enforcement. Since June, parking enforcement officer Kyle Ashley took to two wheels and his @TPS_ParkingPal Twitter account to catch the blockers. I spoke with Kyle recently to find out more about parking enforcement challenges. What inspired you to become a bike cop? I joined parking enforcement four years ago with the first two years being in a car. Having grown up biking in a small town, I felt disconnected and took a police bicycle course. During my bicycle patrols, I noticed people didn’t care about the problem of vehicles blocking bike lanes and wanted to do something. The Toronto Police College taught a social media course, which encouraged me to find my own voice, ask where I am needed, and develop a proposal with the manager. I felt I owed it to the cycling community to advocate for safety. Since starting your bike lane parking enforcement blitz in June, could you tell us where some of the ticketing hotspots are? The areas with the highest volume of cars, deliveries, and condo density get the most tickets. This has been noted in the Entertainment District, Peter Street, and Adelaide from York to Victoria Streets (a.k.a. the gauntlet). An unexpected hotspot was Annette and Runnymede, where I ticketed eight vehicles within a short period of time. 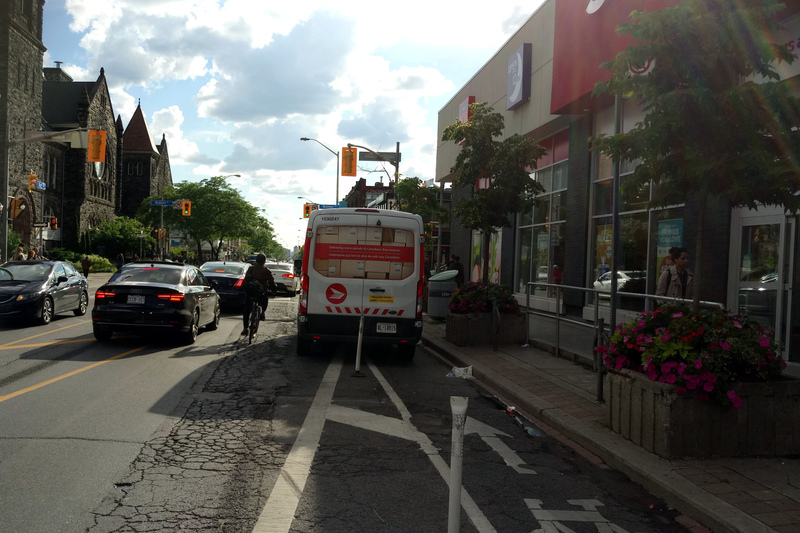 There was less ticketing on the Bloor bike lanes except from Bathurst to Spadina. Presence deters behaviour and people need to be given expectations. How many tickets would you issue on a typical day? I usually issue 35 to 45 tickets daily, though these include sidewalk and bus stop violations. I estimate 20 to 25 of those tickets are bike lane related. The Toronto Police issued 4,486 tickets this year to date compared to 7,285 in 2016. Based on current trends, I predict 400 more tickets would be issued in 2017 compared to 2016. Since Canada Post’s announcement they would stop blocking bike lanes, what trends have you noticed? How have other courier and taxi companies responded? Canada Post was one of the biggest bike lane offenders. This picture was taken recently at Bloor and Walmer. Through my discussions with Gail Souter at Beck Taxi I've discovered that they've been proactive by sending training bulletins, community feedback, and notifications to their drivers’ iPads. Other courier companies (like FedEx and Purolator) followed suit with people-moving businesses being our next focus. We anticipate an announcement from Uber soon. This will create a domino effect encouraging people to stay out of bike lanes. Tell me about the two new additions to the bike lane brigade. The June bike lane blitz lead to positive community encouragement, a growing movement, and people asking, “can we clone you?” Julie Mollins launched a petition supporting my efforts and I was made permanent. 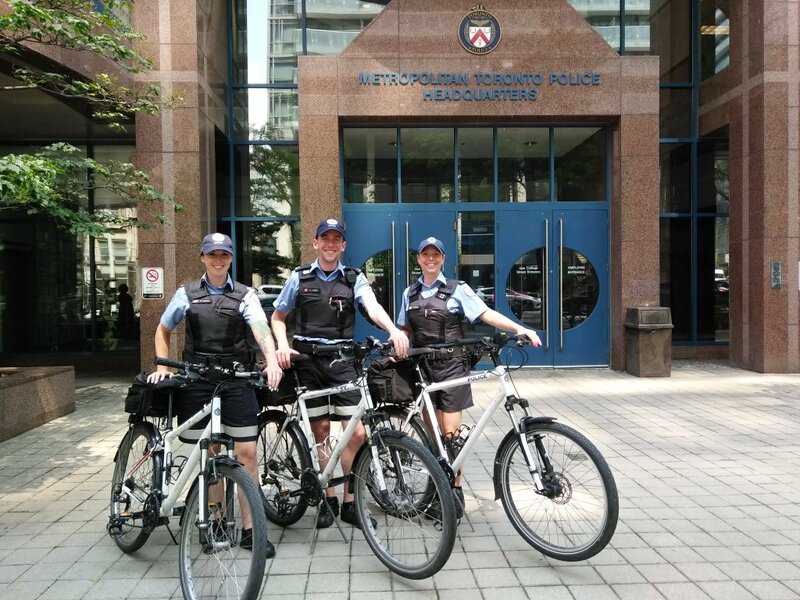 My manager announced two officers – Erin Urquhart (@TPS_BikeHart) and Sabrina Kloetzig (@TPS_pke_rider) – will patrol east of Spadina Avenue which has a higher number of infractions, while I deal with the west end. With both Erin and Sabrina trained on social media, it was the best way to allocate resources, fill a service gap, and increase towing. What additional costs are associated with towing? When a vehicle is impounded, drivers must pay $80 in addition to the $150 ticket if they catch the vehicle (in the act.) Once at impound, that additional charge becomes $150 to $200, plus towing fees and transit to impound. In all, they could face a $300 to $400 day. Your team works from 10:30 a.m. to 6:30 p.m. How are cyclists protected during the morning rush hour? Our unit has 250 parking enforcement officers. There are dedicated teams for both morning (6:00 a.m. to 2:00 p.m.) and afternoon (1:00 to 9:00 p.m.) rush periods. The west and east sides – divided along Spadina Avenue – each get 20 officers during the morning rush. Additional compressed shifts are also provided for dispatched complaints. NOTE: Those not on Twitter can call dispatch at (416) 808 - 2222 to report bike lane blockers. What was your weirdest ticketing reaction? Once on Dupont Street under the bridge, a Purolator van was parked in the bike lane and the driver was on the phone. When I wrote the ticket, he asked for some common courtesy to let him off. I was assaulted once – something 60 parking officers have experienced this year to date. But the weirdest reaction yet was when I was thanked - some drivers actually thanked me for being ticketed. When not patrolling, where is your favourite place to bike? I enjoy casual rides along the Martin Goodman Trail and Sunnyside Beach. Even when on patrol, I enjoy riding downtown given it makes me feel liberated with traffic behind me. Riding downtown is a good way to meet people, and it is safe and enjoyable; so go out and gain the confidence to ride! What is the role of parking enforcement in achieving Vision Zero? Last week, I attended a talk with Vision Zero Canada executive director Larkin, given I followed the idea for years and wanted to understand how parking enforcement plays a role. Even with safe infrastructure (e.g. 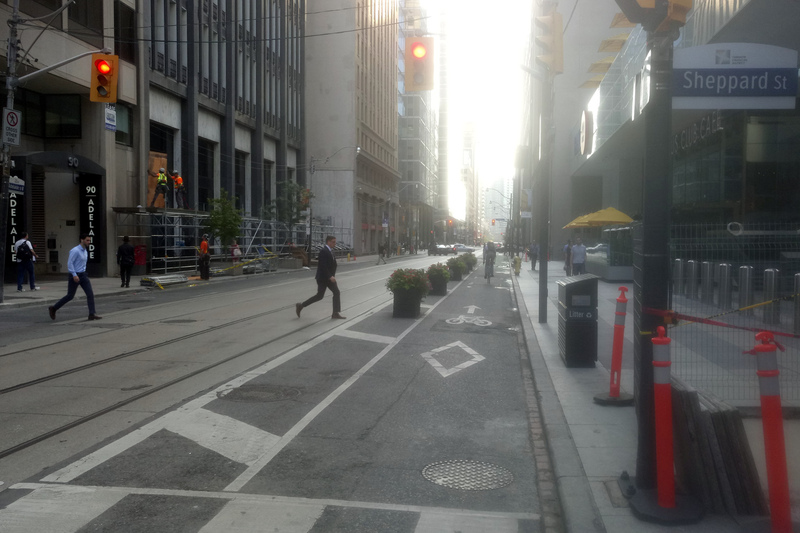 planters on Adelaide), vehicles can sneak in and enforcement is required. People still make poor decisions and everyone has a part to play. It is for that reason I will be participating in Cycle Toronto’s Ride for Safe Streets next month. We need to show courtesy and kindness to change how people think and feel; including shifting focus from “me” to “we.” This is not a war on cars, but a war on things that are unsafe. People are more important than products or parcels.